"Understanding the relationship between weather and climate are important first steps to understanding larger-scale global climate change," says NYSG Hudson Estuary Specialist Nordica Holochuck, who tested this and other lesson plan concepts with educators during a mid-November workshop on climate change and its impacts. Holochuck has been working with partners from Cornell University and the New York State Department of Environmental Conservation's Hudson River Estuary Program on this new series of teaching curricula designed to help middle school students understand climate and weather basics and explore climate change-related issues close to home in the Hudson River Valley. The teaching curricula fit into Learning Standards for New York State, Next Generation Learning Standards and the Common Core. This year, 109 teachers took part in five workshops that focused on Great Lakes watersheds, the Buffalo River, Lake Ontario and Lake Erie. Those teachers agreed to conduct stewardship activities with over 11,325 students from 4th grade through high school. "By using the 'Teach-the-Teacher' approach, we engage teachers in experiential learning and provide them with information and classroom-tested curriculum developed by Sea Grant and NOAA," says NYSG's Coastal Education Specialist Helen Domske. New York Sea Grant's Coastal Community Development Specialist, Mary Penney, and Coastal Education Specialist, Helen Domske, are recipients of awards voted on by Sea Grant-ers from programs in the nine Great Lakes states. Also shared at this June 2014 Sea Grant conference was the latest regional news on invasive species partnerships as well as impacts from the harmful algae blooms that have been cropping up around the Great Lakes. Spread the word and educate your family, friends, and neighbors about ways they can help protect the waters of New York, from the Atlantic Ocean and Long Island Sound to Lakes Ontario and Erie and all points in between. First produced in 2003, this updated guide highlights regional education organizations providing K-12 estuary-related field trips, lesson plans and classroom activities. The directory aims to introduce educators to the dynamic network of organizations and resources available to help students learn about the harbor. Kids learn about some Long Island fish species - including bluefish, summer flounder and striped bass - while they color away and draw lines to their favorite catch. New educational materials for teachers: lesson plans, background info, handouts and supplemental activities. This info, which can be used in formal or informal classroom settigns, is aligned with NYS Education Learning Standards. Download fish-themed matching, word finds, word jumbles and mazes. 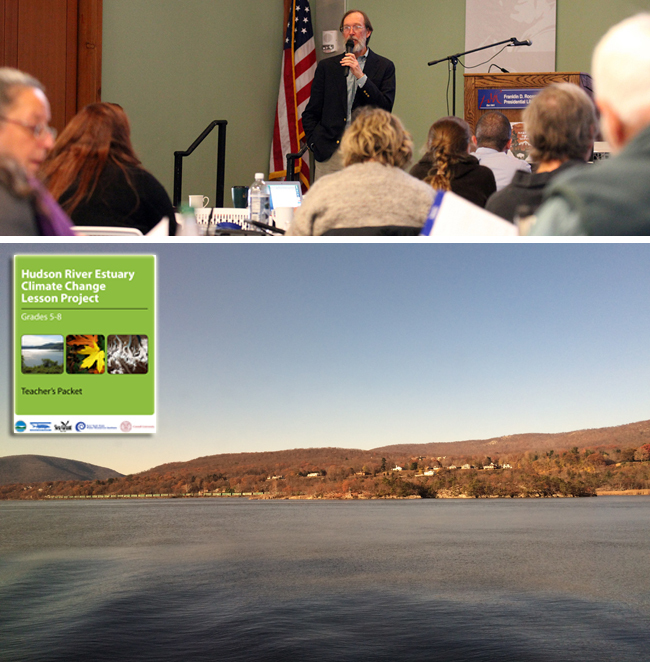 New York Sea Grant uses hand-on workshops and a “teach the teacher” approach to extend science-based learning through teachers to students throughout New York’s Great Lakes region. Topics include critical environmental issues such as water quality and invasive species. NYSG Great Lakes partners with the Centers for Ocean Sciences Education Excellence (COSEE) Great Lakes, the National Science Foundation, National Oceanic and Atmospheric Administration, National Sea Grant College Program, University at Buffalo, Buffalo Museum of Science and others to make programs possible. Sea Grant programs in New York, Michigan, Illinois-Indiana, Ohio, Pennsylvania and Wisconsin have partnered to create training curricula materials centered around the AIS-HACCP concept. NYSG Coastal Education Specialist Helen Domske worked with others in the Sea Grant programs throughout the Great Lakes to produce, among other things, a Field Guide to Fish Invaders of the Great Lakes Region. The guide includes full-color illustrations for 38 invasive and common look-a-like native fishes. “The purpose of this guide is to assist private and public fisheries personnel in identifying and reporting potentially invasive fish species that pose threats to the recreational, environmental and economic value of the Great Lakes region,” says Domske. The guide is also designed to accompany AIS-HACCP training workshops (for which Domske and others in the Great Lakes Sea Grant network have given and continue to offer), curriculum, video and other program materials. For more, click here or request copies through New York Sea Grant at 631-632-6905. “The purpose of this guide is to assist private and public fisheries personnel in identifying and reporting potentially invasive fish species that pose threats to the recreational, environmental and economic value of the Great Lakes region,” says Domske. The guide is also designed to accompany AIS-HACCP training workshops (for which Domske and others in the Great Lakes Sea Grant network have given and continue to offer), curriculum, video and other program materials. For more, click hereor request copies through New York Sea Grant at 631-632-6905. The Centers for Ocean Sciences Educational Excellence (COSEE) Great Lakes has developed a collection of 41 innovative classroom activities to provide teachers and students (grades 4-10) with insights into the uniqueness of the Great Lakes and their influence on aquatic life and human populations. COSEE GL believes that as students engage in these interactive and thought-provoking activities, they will gain an understanding of Great Lakes science, issues, and potential solutions. Activities in the CD have been aligned to NY State Standards. Examples of 7 of the 41 activities from CD are available as FREE downloadable activities to provide teachers with a sampling of our Greatest of the Great Lakes - A Medley of Model Lessons collection. Click here to request these materials from one of our partner programs, Illinois-Indiana Sea Grant. Exotic Species Compendium of Activities to Protect the Ecosystem (ESCAPE) is a collection of activities developed from the Exotic Species Day Camp Project for Educators. This package includes 36 user-friendly sets of lessons that incorporate experiments, art, music and games. Activity-based lessons are cross curricular, appealing to a range of learning styles. New York Sea Grant was involved in the development of the ESCAPE Compendium along with Sea Grant partners in Illinois-Indiana, Ohio, Michigan and Minnesota. New York teachers contributed activities to the Compendium.